To determine incidence and risk factors for traumatic graft rupture following primary and revision anterior cruciate ligament (ACL) reconstruction. All cases of isolated ACL reconstructions (primary or revision) performed at our institution between January 2007 and December 2010 were included. 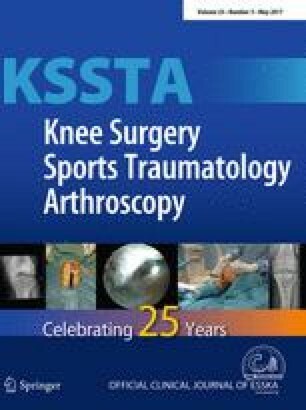 From this group of 2467 primary reconstructions (32.4 ± 12.2 years) and 448 revision reconstructions (33.0 ± 10.4 years), we identified all patients who underwent revision ACL reconstruction following traumatic graft rupture in further course and all patients who underwent contralateral primary ACL reconstruction until January 2014. Age, gender, time from index procedure and graft diameter (for hamstring autografts) were analysed in terms of being a potential risk factor for graft rupture. Within a follow-up period of 5.0 ± 1.1 years (3.0–7.0), a total of 82 traumatic graft ruptures were identified, resulting in an incidence of 2.8 %. Seventy-three cases were seen following primary reconstructions (3.0 %), and nine cases following revision reconstructions (2.0 %), respectively (n.s.). Age younger than 25 years was identified as a risk factor for both groups (p = 0.001 and p = 0.008; odds ratio 6.0 and 6.4, respectively). In primary reconstruction, male patients had a higher risk of graft rupture compared with females (3.7 vs. 1.6 %; p = 0.005), and the first year after index procedure was associated with a higher risk of graft rupture compared with the following (p < 0.001). Graft diameter did not influence the risk of graft rupture. Incidence of contralateral ACL rupture was 3.1 %, which was not different to the incidence of graft rupture ipsilaterally (n.s.). No statistically significant differences were seen between graft rupture incidence of primary and revision ACL reconstructions. Young age (<25 years) and short time to the index procedure (especially within the first year) were confirmed as risk factors for graft rupture in both groups. Male gender was a risk factor for primary reconstructions. Graft diameter had no influence on graft rupture rates. No difference in incidence of graft rupture compared to ACL rupture on the contralateral side was apparent. Retrospective case series, Level IV. M. Schlumberger and P. Schuster have contributed equally.